A high angle rising aerial establishing shot of traffic passing on the Rochester Monaca Bridge over the Ohio River in Western Pennsylvania. 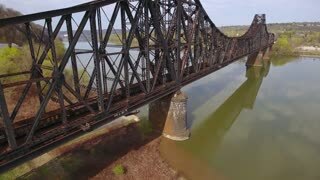 A dramatic profile aerial view of an empty, large railroad bridge spanning the Ohio River in Western Pennsylvania. The towns of Monaca and Rochester in the distance. 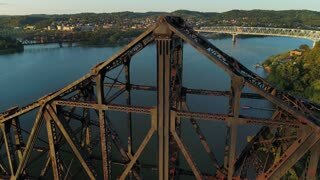 A high angle aerial establishing shot of the various bridges spanning the Ohio River in Western Pennsylvania. The towns of Monaca and Rochester, PA in the distance. 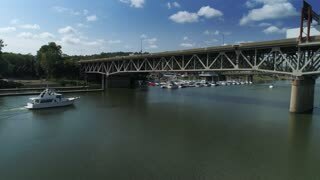 A forward rising aerial view of traffic traveling on a bridge on Route 51 in Western Pennsylvania while a recreational boat passing underneath. ROCHESTER, PA - Circa September, 2017 - A forward high angle rising aerial establishing shot of a cargo train traveling over a railroad bridge in Western Pennsylvania. The Ohio River is in the distance. A daytime aerial profile perspective of traffic passing over the Rochester Monaca Bridge spanning the Ohio River in Western Pennsylvania. A high angle forward moving aerial establishing shot of the small Western Pennsylvania town of Rochester. The Ohio River is in the distance. A dramatic reverse rising aerial establishing shot of the small western Pennsylvania town of Monaca on the Ohio River. 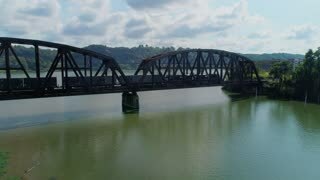 A slowly moving forward aerial establishing shot of the small western Pennsylvania town of Monaca on the Ohio River. A slowly rising forward moving aerial establishing shot of the Ohio River and the small town of Rochester, Pennsylvania in the distance.